Ultimate Gift Basket Giveaway Contest! The Greenest Dollar is having another giveaway contest! Yahoo! And boy howdy, is this a good one. This amazing gift basket is stuffed full of eco-friendly products for you to revel in. The contest runs until December 15. To enter, simply leave one comment on this post, per day. This is going to work on the honor system, so please be fair. After the contest ends, I will choose the winner using Random.org. Please make sure to use an email address that’s valid, since this is how I’ll be contacting you if you win! I’ll announce the winner here on the site on the 16th. Important Note: I’m not collecting email addresses for any purpose other than this contest. Your email address remains confidential. The necklace itself is made of antique brass, freshwater pearls, glass pearl drops and swarovski crystal rondelles. There is also a pair of chandelier/drop earrings that feature brass roses with rhinestone centers (salvaged them from a broken necklace), glass beads and faceted glass drops. The earwires are gold filled. 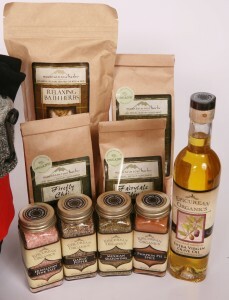 Items include a delicious selection of products from the Epicurean Organics Line including organic spices and oil.A truly revolutionary line of products, Mountain Rose Herbs’ Epicurean Organics are redefining the culinary landscape, one bold flavor at a time. Every aspect of the Epicurean Organics line is one-of-a-kind–from the rich colors and flavors of the certified organic ingredients grown without chemical pesticides or herbicides, to the remarkable commitment to farmers’ rights and organic farming research. You’ll also find some of the most popular tea blends including Fairytale blend, Women’s Balancing, Firefly Chai and the amazing Relaxing Bath Herbs. 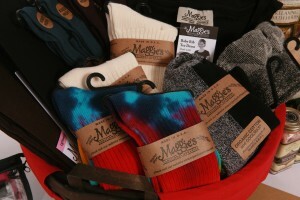 A Selection of crew socks in natural and tie dye, mantra socks, urban hiker socks, lightweight tights, sports socks and a baby rib tee dress. So, where did this basket of luscious green delights come from? I teamed up with C Results Communications, who organized all these green vendors together to sponsor the contest. Thanks Chelsea! You’ve been amazing. If you’re interested in learning more about these eco-friendly products, please check out these sponsors. They rock. Remember, the contest runs until midnight on December 15. And, you get one entry per day. So, start commenting away, and good luck! Wow, what an awesome gift basket! Awesome basket, pick me, I know I have been good all year, what a great selection. So many amazing products, that is so generous! i agree. for the socks! That is one amazing gift basket you’ve put together! I’d love to win it! What an awesome giveaway! Thanks to you and the sponsors! PICK ME, PICK ME!!! Thank you sponsors! What a fabulous idea! And such great stuff! Wow, what a fabulous prize. Count me in! What an awesome gift basket. I would be so thrilled if I won. I’d be happy with just the Mtn. Rose Herbs, but the whole package is pretty spectacular! Wow – that is so awesome! I would LOVE to win! What a great idea! Just in time for the holidays. Where’s the “environmentally safe” beer? You know, the “low methane” producing brand? Where’s the pretzels made from Tofu?? Where’s the DVD of “101 ways to ‘outgreen’ your neighbor, that $%&#[email protected]!!”?? I’d write more, put I’m right in the middle of trying to change my name, on-line. So, start posting readers! Those socks could be yours!! And just be glad she didn’t put any “Hemp Thermal Underwear” (one size fits all) in there, too. That stuff is scratchy! Please pick me! My husband is serving in Korea in the Army and this would be a wonderful pick me up! 3 kids and me make for some sad people while daddy’s gone! I so admire the generosity of so many bloggers! Thanks for hosting such a generous giveaway! Hooray for free warm socks! ohhh merry christmas to me…..
Great gift basket, count me in. omg i want everything in that basket!!!! I’d love to give this away. It has some awesome stuff! Love the cosmetics, what a great giveaway! Wow! Amazing! Super! EXCITING! What a treat for a lucky winner…I hope it’s ME! I’ll be back tomorrow – you can bet on it. Organic make-up? I’m all over it! Wow! What a great basket! I love Mountain Rose Herbs- and Maggies too! Thanks for making the effort to do this giveaway on top of all the cool tips and information on green issues. I always look forward to your post! I’d love to enter, please, if Canadians may. I repost your stuff all the time, thank you! Looks like an awesome basket! Very sweet giveaway! Oh how I’d love to pamper myself, after all I’m a mom of three (yes that’s right!) boys under the age of 5!! I think I lose a little of myself each day amongst the mounds and piles of trucks, cars, and transformers on the play room floor. Any who thanks for doing this! Good luck everyone! WOW! Are you serious? This is a really sweet giveaway. I am just salivating over those spices and all the other goodies look so wonderful. Thank you for a chance to enter my name. All i want for Christmas is the ultimate gift basket!!! I love all natural products, I work for a cleaning company that uses all natural products. We are always looking for new ideas and cleaning products. I would love to try your products. I Just Love this Gift and I really want to Win!!!!!!!!!!!!!!!!!! What a fabulous collection of gifts, and such a great idea! Awesome! Awesome! Awesome! What generous sponsors. I’d love to win this…..so PLEASE PICK ME!!! Many thanks! Only 22 days till christmas! I love the goodies! I hope I win. Ooh, second day entry. Thanks for the giveaway. Oh wow! What a neat basket. Good luck to all of us but especially me! I’m back again! Reading about homemade Christmas decorations but dreaming about this lovely gift basket!! I love, love, love this basket! If I win this basket, I’m super excited to try the spices you raved about! Thank you for this opportunity to win these great products. Go Green!! I’d like to enter again today, please! Wow, this list is growing! You’re the best to offer this winning opportunity–thank you! 2nd day entry! This basket is so neat, I’d love to be able to post “reviews” should I win it. I love how delicious and beautiful natural products can be. 2nd day entry! I can only use Natural Products due to several medical conditions. Thank You for this Christmas Giveaway, every little thing Helps…. Do we leave a comment to this post or other posts as you add them? #71 on your list of a million more responses I’m sure you’ll get. commenting again, I really want this basket! Thinking positive about all those goodies–would love to be picked! Dec. 6 – and my reply is “I’m not sure that I want to go to work because it’s below 40 and a Sunday” …give me a blankey and hot chocolate! I am committed!!!!! So here is my next comment for this delicious basket of goodies: YES! YES! YES!!!! I am greatful to be a participant in this contest. ooh I hope I get this. I love it! Here’s my entry for Decemeber 6th! I just realized that I’ve been looking at Mountain Rose herbs and ingredients for years, woo hoo! Third Day Entry, I Really Want To Win!!!!! I Need This Very Much!!! Thank You!! Dec 6th entry: I work at the Pittsburgh Panters and Steelers games on weekends…. and winter officially hit Pittsburgh this weekend! My feet were frozen after working all day, and I know the socks from this basket would have come in handy! I just moved and this would be so awesome to win! Hoping and praying to win, to complete my holiday gift list–really love the jewelry! 12/7 entry. Ughh….is it Monday already? Dec 7th entry- happy Monday everyone! Less than three weeks until Christmas. Time for me to slow down! MOnday is white, not blue here! Entry #3…I think! The Noaki Jewelry is so pretty! I’m trying to find my girly side again. I lost it along the way while trying to raise three boys. Plus the hubby…and the boy dog! Commenting again for another chance to win. Woohoo! Happy Holidays. Another Monday, come & gone! Only 4 more days till I am done with the semester! Aw, can’t we all be winners? From the wintery plains another entry, need those socks today. Dec 8th entry- still hoping to win, so I can split that basket up into a few nice holiday gifts! Yea! One day closer to the big day! It’s snowing in Iowa! Happy Day! Only 7 more days!!! I can’t wait! Gosh I’ve been sick a couple days and didn’t get to my computer, but I’m back again and hoping I might be a WINNER! Well, ok, I KNOW I’m a winner, but I’d love to have this basket too! What an awesome basket, I hope I win! Green is awesome and I’m trying to stay as green as possible with a limited budget. Thanks for the possibility! What about manifesting a tiny green house to stay warm in this winter?? Just one week to go until Dec 15–how exciting! Would love to be a winner of these great products–thanks for my entry. Ooh, what a great giveaway! Thanks for posting and I’ll be back tomorrow! Its wednesday, its wonderful, its wild weather out! Dec 9th entry for the contest! Its a beautiful sunny Wednesday in North Carolina! Your cosmetic line looks so pure and natural–would love to share with a couple of friends that also have skin problems–thinking positive! it was 15 below this am, the cats wouldn’t even go outside! Interesting post America is poor book, we really do rely so much on credit, trying to keep up the Jonses, so stupid! Is it really keeping up with the Jones’s or partially cultural technology imposed on us. For instance, you can’t rent a car without a credit card, and it’s pretty much impossible for me to work without internet and a cell phone because of the expectations of our way of doing things in the work world. So, there are certain piece of technology as well as travel expectations that are expected and required of us that were simply not there years ago. I simply don’t carry a balance on my credit card and try to be mindful of what technology I actually need. Almost there! Hope everyone is having a good week and staying warm. Commenting again – hope I win! I would really LOVE this basket. I hope I win!! hope hope!! me too. I hope I win! Hope I win, would probably split the basket up for all the ladies in the family. Time to get serious about things. Counting down the days until a winner is announced! Oh, how I hope it’s ME! still looking forward to winning this basket!!!!! Another Cold Day and Another Entry to Win this Amazing Gift Basket!!!!! 5 more days until the drawing! Chalk up another entry for me, please! Maybe we could divide up the ultimate gift basket into several parts, so that there is more than one winner—-wouldn’t mind that at all! I’m freezing. ignition switch went out on the gas heater. Friday, Friday, Friday!!!! Fingers crossed. Wrapping Christmas Presents and feeling the spirit! All I want for Christmas is This Basket and My Two Front Teeth!!! hehe lol…..
Hi! TGIF!!!!! Off to meet friends for a holiday dinner! Barely remembered to get this in to you! Heading home tomorrow for christmas, so excited! Here’s my entry for December 11th! I’m looking for some good news on the 15th! Wow, a gift basket would be really nice to share this holiday season! Brrrrr! Happy cold Saturday. I feel like a winner! In the unlikely event of rain in Los Angeles, I’m a winner! Since it’s pouring outside (and in my windows… grr landlord! ), I’ll just take that prize now. These comments are getting interesting as people run out of things to say. Great contest! Counting down the days to the 15th and submitting another entry in the Grand Hopes of Winning this Amazing Basket of Goodies!!!! Thank You…. Dec 12, and here is my entry–Happy Winter! Looking forward to sharing the basket of goodies with my family and friends! Dec 12th entry- great question Kim! I walked to the grocery store, and used the heat from my oven (since I was cooking dinner anyway) to kick down the thermostat a few degrees until I start feeling a little chilled. Another day, another entry!!!!! Hope everyone is having a great holiday season so far! Sunday, Dec 13 all ready! Getting so much closer, and still hoping to win. The weekend is almost over. Enjoy your Sunday! Another entry for the basket! 2 more to go! Uh oh am I too late to enter?! Hope not 🙂 happy holidays everyone!! Kim poses a sweet question: what have I done to live more green today? Today (Sunday) I biked to church, then to the farmers’ market. At the FM, I bought all organic, local produce and then biked home. Later, I biked to a choral concert. Now, I’m keeping warm with a blanket and hot tea instead of cranking up the thermostat. I haven’t seen my sister in 28 years, my brother in 6 and parents in 12 and all of us are meeting in Arizona for a get together………..this basket would seal the deal. We’re almost there! Good luck to us all for the Ultimate basket of goodies! Only one more day! Have a wonderful Monday and start to your week! Good Monday morning and one day to go yea!! YAY can’t wait to see who the winner is!! I love these comments! Everyone is so happy and positive. Thanks for making me smile. Eee… everyone already commenting *must* be an east-coaster. I’m pretty sure I’m the only one awake yet on the left side! Only One More Entry to go, I’ve made it every day so far and I can’t wait for the Winner to be Picked. Good Luck to Everyone. This is the Hardest and Saddest Christmas We’ve Ever Had. No Gifts Or anything Just Trying to Keep Our House, Job, and Car. I know Many Of us are in the same boat. Hey Connie C so sorry to hear about your sad christmas this year, its definatly going to be a hard one for a lot of people this year. Only 3 posts, hopefully it will be my lucky day! Hurray! This is it–Happy December 15! Looking forward to hearing who the winner is! Keeping positive! Getting closer, can’t wait to see who the winner is….hope it is me. Last entry! Good luck everyone! It was nice seeing what everyone had to say over the past week or so. The latest post about following your passion was great, thank you! good luck everyone! Off to work I go.